Note: this post was originally written in July during my trip to Europe. I have found that sharing my high opinion of Rotterdam with others elicits a variety of responses ranging from furious agreement to simply fury. On the upside, it does stimulate discussion on the relative drawbacks and merits of Dutch cities which I find quite interesting. Nevertheless, I would still pick Rotterdam as my favourite city in the Netherlands. The first and most important reason to me is the city’s urban form. Despite its reputation, Rotterdam is a beautiful city. I am generally not a big fan of modernist architecture in Australia. I would be hard pressed to come up with more than four or five buildings in the whole country of this style that I would consider attractive or well-designed. As a result, I believed that I did not like modernism. Rotterdam quickly changed my opinion. The city’s bombing by the Luftwaffe during the German Invasion of the Netherlands in May 1940 left almost the entire central area in ruins. The post-war rebuilding was in the style of the times which resulted in tens of thousands of public and private modernist constructions. This combines with the older styles of architecture in other areas that make the buildings both interesting and aesthetically pleasing. It is not just the style of architecture that attracts me to Rotterdam’s urban form. It is also the scale and size of the city. Most residential or mixed-use buildings are between three and five storeys in height; the perfect balance between density and the human scale. To my mind, this attention to the scale of people and the city’s relatively wide streets make Rotterdam feel expansive without being empty. In contrast, Amsterdam and The Hague felt too cramped at times. Perhaps this was due to the large volumes of tourists, but the point still stands. This point probably relates to all Dutch cities, but Rotterdam more than pulls its weight in relation to the rest of the Netherlands. As I wrote previously, its near-flawless integration of transport modes makes travelling incredibly easy and convenient. You could write several books on how well the city has done, but highlights include the OV-Fiets bicycle hire service, seamless train-tram transfers at Rotterdam Central Station and general separation of trams and traffic. The other main point to mention related to transport is, of course, bicycles. 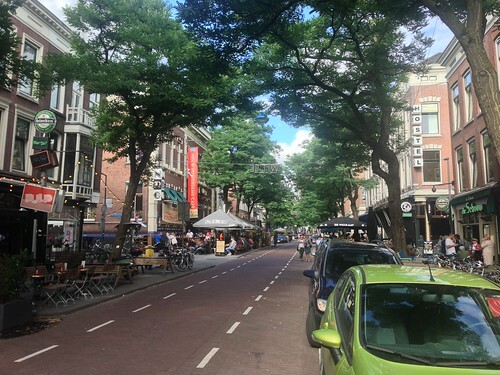 Despite being told beforehand that it was one of the least bicycle-friendly cities in the Netherlands, in my relatively short trips to several Dutch cities I found Rotterdam to be the most pleasant city in which to ride. 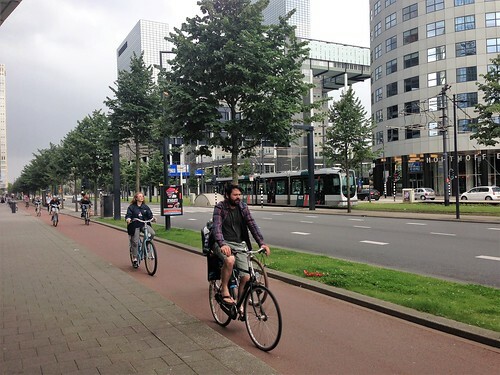 Despite Amsterdam’s reputation as a cycling city, Rotterdam has better bicycle infrastructure. This is mainly through no fault of the former city as they have much narrower streets and more challenging street layouts with which to contend. There are many more separated bicycle paths and lanes in Rotterdam rather than the significantly less useful on-road paint that was far more prevalent in Amsterdam. 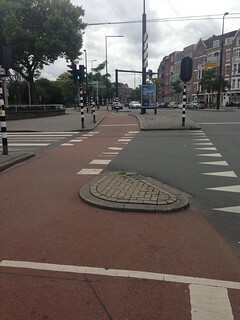 Over my two-and-a-half week trip, every major intersection that cycled through in Rotterdam had separated bicycle treatments regardless of whether there was a separated path along the rest of the street or not. This is a lesson that other cities would do well to heed. It really makes a huge difference to actual and perceived safety in so many ways. Put simply, Rotterdam is a really nice city. 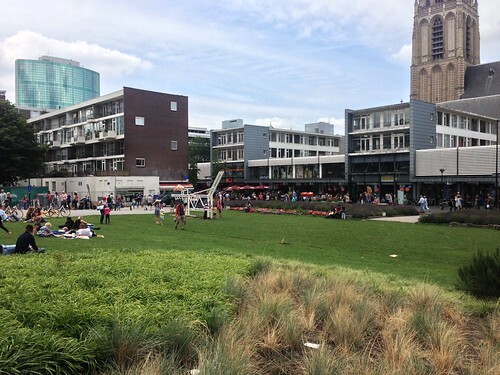 Again, this could easily apply to any other place in the country, but I found Rotterdam to be the most pleasant. It is hard to articulate why this is exactly the case. It is more of a feeling than any sort of objective metric. But wherever I went throughout the city, it just felt like a beautiful, happy and pleasant place. 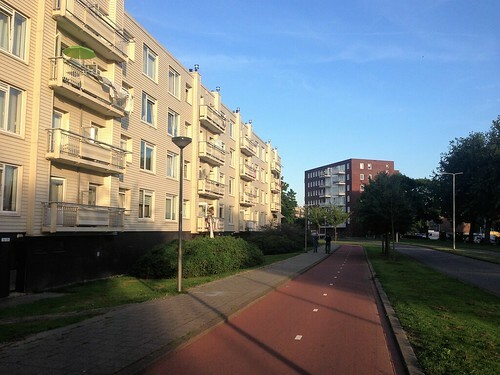 On one occasion, I unwittingly found myself in an area of public housing which is one of the least safe parts of the city, according to Dutch people who heard this story. This was not apparent to me at the time but while I was there, it too felt like a pleasant place. 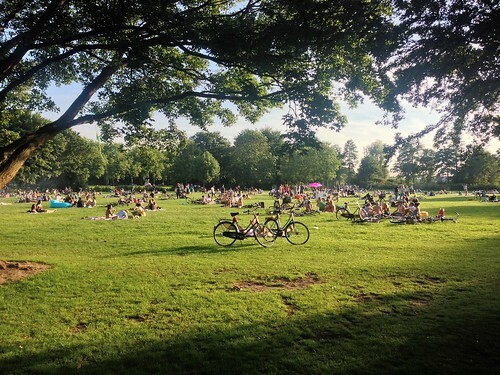 People were weeding their community garden plots, neighbours were holding outdoor dinner parties in the local park and children played in the street (one group asked to borrow my bike). Everything about the area – the buildings, atmosphere and people – felt calm and content. This was the case no matter where I went (with the notable exception of parts of West-Kruiskade). Even the Port of Rotterdam felt surprisingly agreeable. It is hard to fault Rotterdam for anything much. Admittedly I spent more time here than in any other part of the Netherlands, but from my perspective it would take a lot to beat.